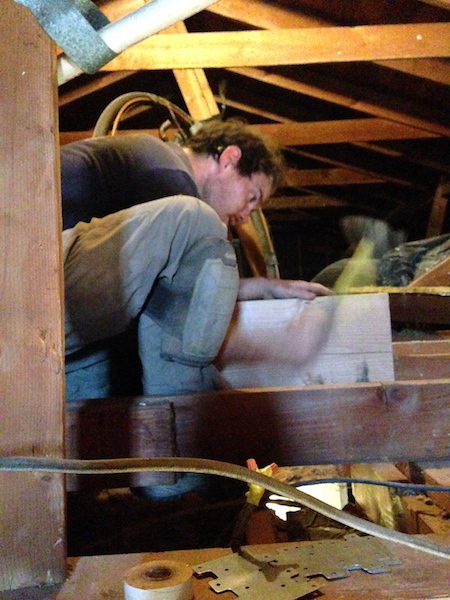 Note: This post describes the construction phase of vaulting our living room ceiling. However, half the work happened before any hammer was swung — designing, planning, and obtaining permits was an arduous and convoluted process in its own right. To read about it, check out Part I. Since we finally got our permit, demolition could begin (see our blog post on that here). 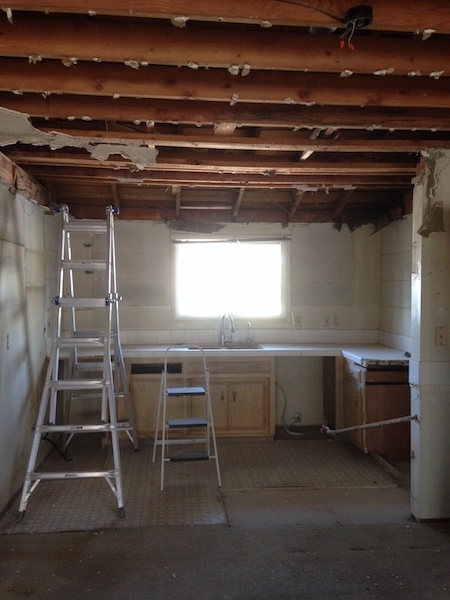 The first step in vaulting the ceiling was to remove the existing ceiling's drywall and structural members. Removing the drywall was fairly straightforward, but extremely messy. I had already sent off a sample of the popcorn ceiling to be checked for asbestos, and it came back negative. After the several hundred pounds of ceiling drywall was hauled away, the ceiling joists were exposed and we could begin removing them. But I wanted to sequence the removal of the structural members in order to maintain integrity during the construction process. Demolition not quite finished, but I decided to start on the vaulted ceiling anyway. In retrospect I should have just gone down to the studs all 'round for the sake of simplicity. I decided to hire professional help for this next stage of the project. Changing the roof structure of the house is something that absolutely needed to be done correctly; the implications of screwing this part up would be both expensive and potentially dangerous. It was the first change I would make to the house (meaning I was inexperienced and intimidated), and it was a big one. I needed some hand holding. I hired local contractors Michael and Christian to help me (or, more accurately, to let me help them) remove the existing roof structure and install the new one. As with the engineer, I needed to find a professional contractor who was okay working with an amateur (who also happened to be the client). My role as both newbie construction grunt and client would inevitably make for some awkward moments. I came to appreciate Michael's and Christian's understanding, willingness to teach, dogged persistence, and good humor. The first task at hand would be to pour the footings for the new posts. This would entail going down into the crawl space and digging holes where the new footings would be poured. It proved to be a herculean task. Michael's foot visible from the crawl space hatch. He is quite alive, but after countless hours of jack-hammering he may be wishing that were not the case. The clearance in the crawl space between the bottom of the floor joists (spaced 16 inches-on-center) and the ground is about 18 inches. Supporting these floor joists every 6 feet are 4x6 girders, and the clearance under these girders is about 12 or so inches, depending on the ground in that area — barely enough room for a fit adult male to squeeze through. These girders are supported every six feet by short 4x4 posts that rest upon pyramidal concrete footings. Some of these footings were on small concrete slabs that were poured into the crawl space ground. In order to make enough room to build the wooden form work to create the four new 18x18x18 footings, some of these footings had to be moved, and the small (???) 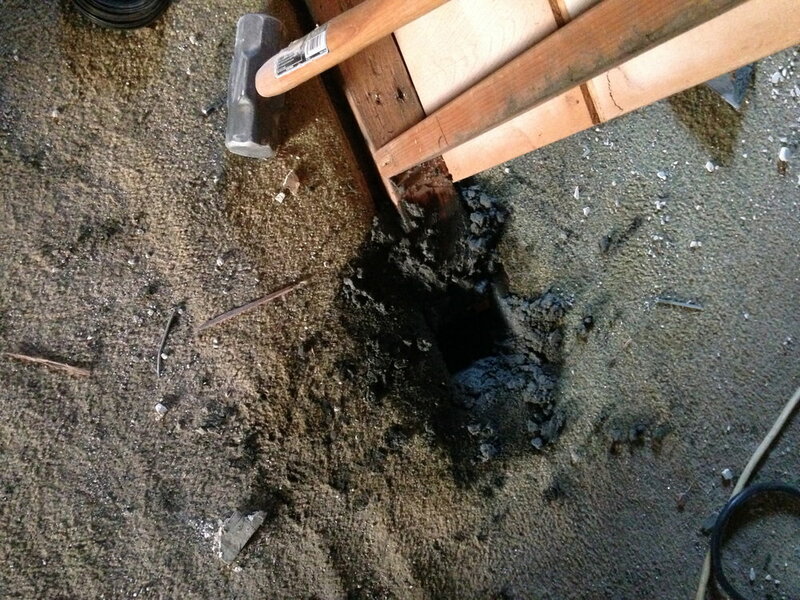 concrete slabs below them broken up into chunks using rotary drills and eventually a 35-lb demolition hammer. A 35-lb demolition hammer...the kind of thing that's exhausting and awkward and unpleasant to use above ground for any amount of time. Now, imagine using that thing to break up concrete in an 18-inch-high crawl space for EIGHT HOURS. That's what Christian and Michael did, with a little bit of help from me. Eventually we got the old concrete removed, the holes for the new footings excavated, and the form work built. Few things invoke a sense of urgency quite like a trailer full of wet concrete sitting in your garage. Michael picked up a trailer full of concrete and we were on our way. We took turns filling up 5-gallon buckets with wet concrete, hefting them into the house, and pouring them through the holes in the floor and into the forms below. This is probably self-evident, but it's worth saying explicitly — concrete is heavy. A full 5-gallon bucket of concrete weighs about 100 pounds, and sometimes we were carrying two at a time. At long last we got the forms filled and the post brackets placed in the curing concrete. We had enough concrete to fill the forms, but it turns out we had too much. Even though we were exhausted, we had to do something with all the extra concrete that was just sitting in the rented trailer, slowly hardening. We put down a big sacrificial sheet of cardboard and poured and scraped every last bit of grey goop into a great heaving blob upon the garage floor. We washed out the rental trailer and left the mass to cure and be broken up and discarded later. It was one hell of a day. The next day they came back and we took off the forms to reveal the footings. They were intact and massive. Mercifully the footings were now done and we could resume our work above ground. We removed the existing ceiling joists in preparation for installing the ridge beam. Ceiling joists removed, exposing the roof structure. We installed the secondary posts and beams to support the ridge beam. This beam supports the center post. This beam over the hallway supports the south end post. Once the three support posts were in place we installed temporary supports to allow us to maneuver the giant ridge beam into its eventual permanent home. And now, the ridge beam itself. The three of us were able to lift the ridge beam up [Wen's note: "THIS IS AMAZING"] onto a platform we built. The 20' ridge beam weighed 300 lbs or so. I thought we were going to lift it up on to the platform mechanically with some kind of winch, but no winch ever materialized. Christian seemed to think the three of us could just lift it up the 8 feet onto the platform. I was skeptical. But somehow we did it. Personally, if I were to do this again, I'd use a mechanical pulley of some kind. The three of us hefting the new ridge beam into place. The ridge beam is made up of thin sheets of wood all glued together, like a giant, thick piece of plywood. This type of manufactured wood product — called laminated veneer lumber (LVL) — is very strong and dimensionally stable, and making it doesn't require cutting down huge old trees. LVL and another engineered wood product — cross-laminated timber (CLT) — are even beginning to be used in mid rise buildings instead of steel in some places. Steel production is extremely energy intensive and creates a huge amount of carbon dioxide pollution, even when it's recycled. Eventually we got the new ridge beam into its final position. We installed temporary supports to hold the ridge beam in place while we prepared the permanent supports. 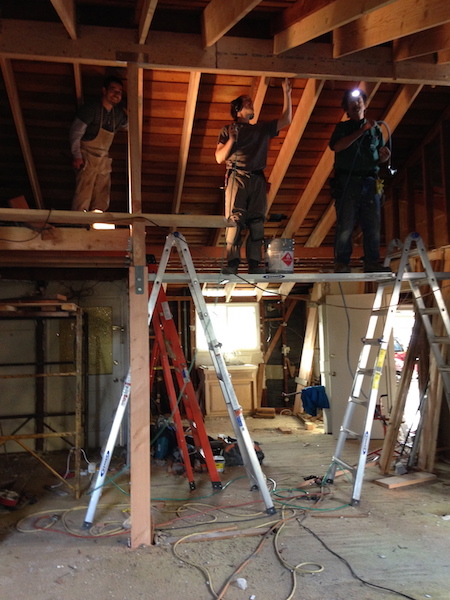 Once the new ridge beam was in place, we could begin installing the new 2x12 rafters. 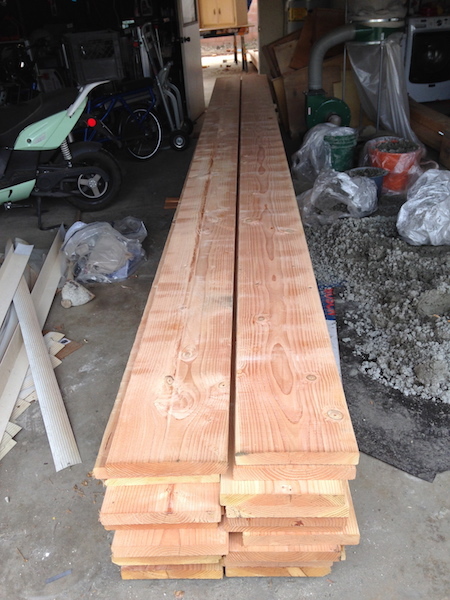 The wood for the new 2x12 rafters just barely fit in the garage. These rafters were almost as long as the ridge beam itself, and they would all need to be cut one by one and fit into place. 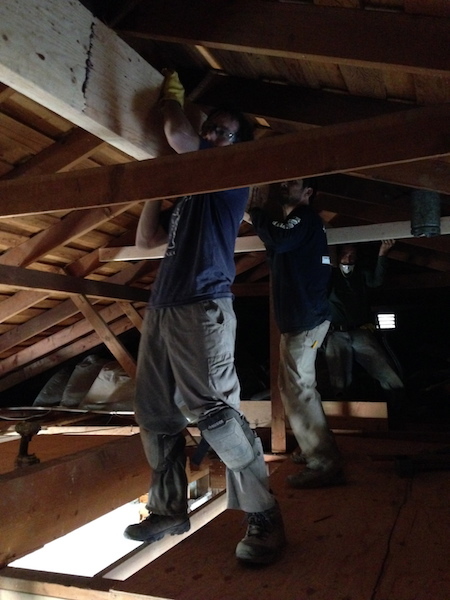 Christian notched the end of each new rafter to fit snugly against both the old ridge board and the new ridge beam. Each new rafter had to be meticulously — and laboriously — slid into its new home next to the existing rafter. I learned that it is difficult to install new rafters into an existing roof. There is very little clearance to get the new member into place. We had to knock out all of the blocking between the existing rafters in order to have enough space to insert the new 2x12s — and even then it was difficult. The new rafters were long and heavy and not always straight. It was definitely a strong two-person job, and some kind of platform or scaffolding is a must. The improvised workaround for the complicated wall assembly required a tenuous two-inch gap between the bearing wall and the lower face of the rafter end. The "birdsmouth" cut that rested on the bearing wall was complicated by my, well, complicated design for the wall assembly. The top half of the rafter would rest on the bearing wall, but the bottom half would be carried by a joist hanger attached to a ledger board attached to the bearing wall. But(!) the ledger board couldn't go on until the wall was finished being insulated and seismic retrofit with interior plywood. So...in the interim the new rafter would be supported only by the top half resting on the bearing wall. This was not ideal since only half the rafter is supported (effectively it's another 2x6 rafter) and it makes them prone to splitting at the notch. But it was the best solution I could come up with at the time, and fortunately it eventually worked out as planned, albeit with a nervous-making, nail-biting interim. This is the kind of detailed, 4th-dimensional task sequencing that's hard to anticipate in the abstract beforehand in the design and planning stages, especially when you're doing something unconventional and/or are inexperienced like me. Gradually, the new vaulted ceiling structure began to take shape. 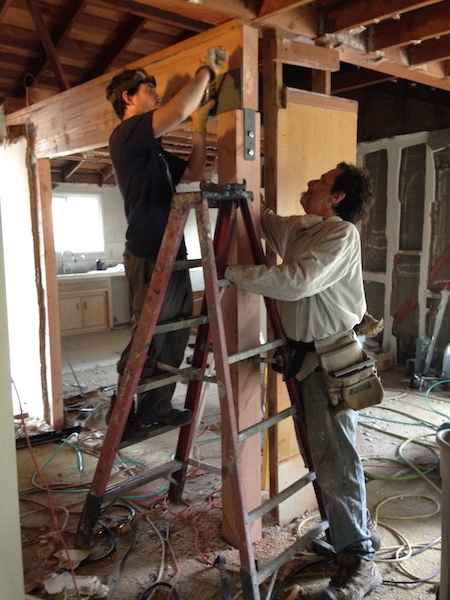 Pneumatic palm nailers helped us get the requisite nails into the brackets in tight quarters. Top half of this photo: relative order. The bottom: utter chaos. Eventually we got all the brackets installed and the new vaulted roof structure was complete! I'm very glad that I had Christian and Michael to guide me through the process. Vaulting the ceiling was a significant undertaking, but it has completely transformed the space, as I hoped it would. What used to feel dark and cloistered is now airy and open. The change has been so significant, it's hard to believe it's the same house. It's been a lot of work, but I'm glad we made the choice to vault the ceiling. Seeing the building model I constructed become reality was incredible; this whole process was a reminder of how profoundly intentional design can influence our experience of a space. Yay for architecture!